Yesterday, many Westporters enjoyed the first real day of summer. The start of a holiday weekend saw Compo Beach packed, the roads filled with bicyclists, backyard grills all fired up. 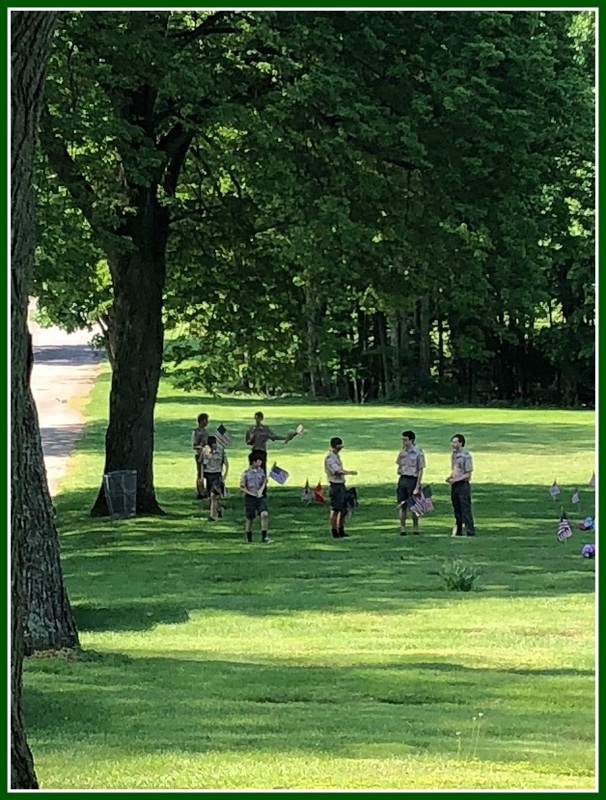 Meanwhile, Boy Scout Troop 39 was busy remembering the real meaning of Memorial Day. They placed new American flags at the graves of military veterans, and decommissioned worn flags, at 4 local cemeteries: Assumption on Greens Farms Road, Greens Farms Congregational by the Sherwood Island Connector, Willowbrook on Wilton Road, and Christ & Holy Trinity on Kings Highway North. 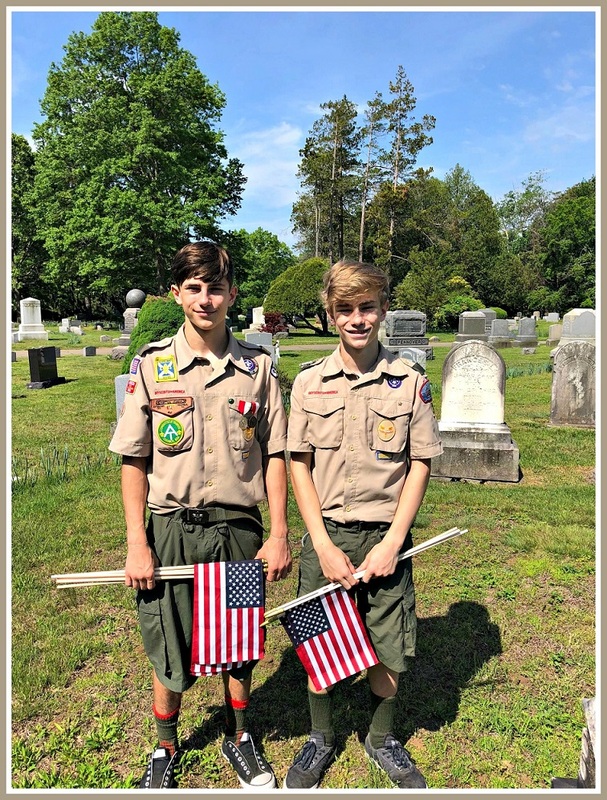 Scouts at Assumption Cemetery, off Greens Farms Road. It was definitely a good — no, a great — deed. If you see Troop 39 at tomorrow’s parade, be sure to give them an extra-proud wave. Terry and Eamonn Brannigan, with their flags. But today. Christmas is so yesterday. Boxing Day is for Brits. Us go-getting Americans need to throw away the toys that no longer work. Toss out the leftovers. And think about getting rid of that big Christmas tree too. Fortunately, there’s help. At least for that last task. 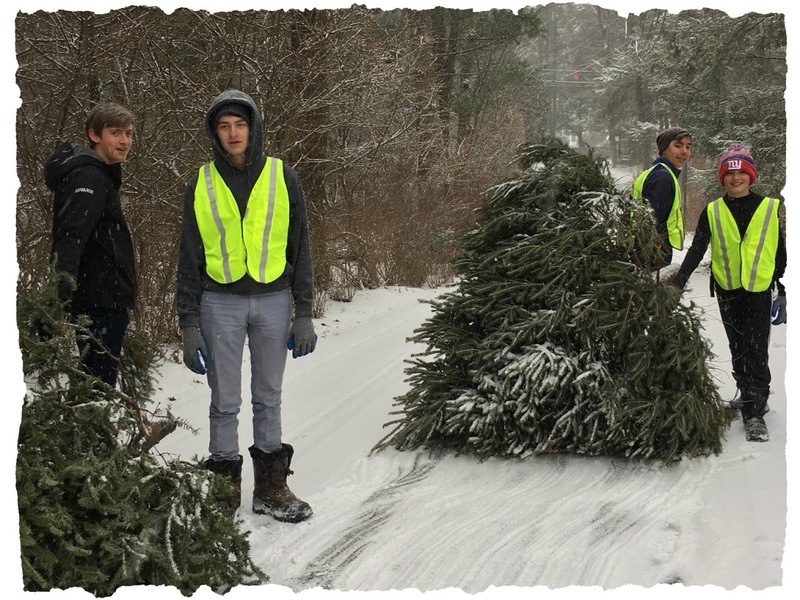 Boy Scout Troop 39 of Westport will happily pick up your tree. That once beautiful, soon dying and needle-dropping symbol of recent holiday cheer can be disposed of with one simple mouse click. Boy Scout Troop 39 to the rescue! To register, click here. Reservations are limited so — unlike Christmas shopping — don’t delay. Place your tree by your mailbox by 6:30 a.m. that morning. Then tape an envelope with your donation to your front door. The suggested donation is $20 per tree (cash or checks made out to “Boy Scout Troop 39” are fine). I’m sure the Scouts would not refuse higher amounts. Funds go toward activities like food drives, community service projects and backpacking trips. The Boy Scouts are well known for “good turns” like helping old ladies across streets. Bush league. In Westport, they help little old ladies — and strapping young men — dispose of big old Christmas trees. NOTE: The Scouts can’t accept wreaths or garlands (the wires ruin tree chippers). You’re on your own for those! On the 2nd day of 2011, we turn our thoughts to…2010 Christmas trees. If you face the annual dilemma — what to do with that once beautiful, now dying and needle-dropping symbol of last month’s holiday cheer — help is at hand. This Saturday (Jan. 8), Boy Scout Troop 39 will pick up your tree. They don’t say what they’ll do with it after hauling it away, but who cares? To register for this much-needed service, click here. The tree should be placed by your mailbox by 6:30 Saturday morning. Tape an envelope with a check (“Boy Scout Troop 39” ) to your front door. Cash is okay too. The Scouts are definitely walking the talk of their 1st law: trust. The suggested donation is $15 per tree, though I’m sure the scouts would not refuse higher amounts. The Boy Scouts are well known for helping little old ladies across streets. In Westport, we thank them for helping little old ladies — and strapping young men — dispose of big old Christmas trees.